Promoted to the rank of general during the independence wars, Miguel Estanislao Soler switched hats between military officer & politician several times during the nation’s early years. 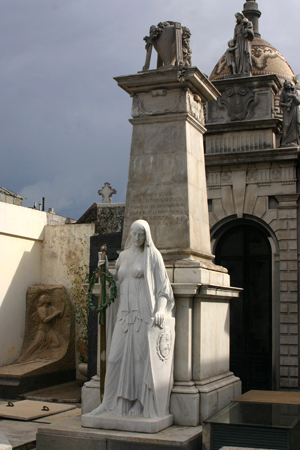 Soler passed away in 1849, but his monument was erected in 1929 & paid for by the city of Buenos Aires. At the top of the column, places & dates of military campaigns tell visitors a bit about the man’s service to his country. 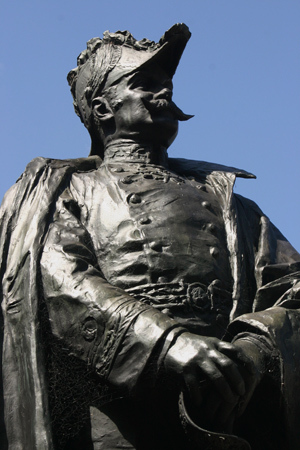 But the statue—generally attributed to Torcuato Tasso—is breathtaking. Situated at the entrance gate, it is one of the first pieces of art seen by visitors. A few allegories are present: military action (the sword), victory (a wreath of laurel) & Argentina (shield with the nation’s coat-of-arms). 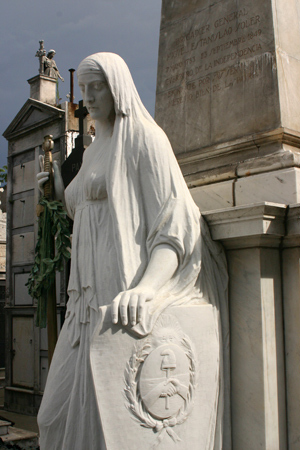 Although it’s tempting to rush inside & wander the walkways of the cemetery, stop for a moment & examine this beautiful statue before diving in. 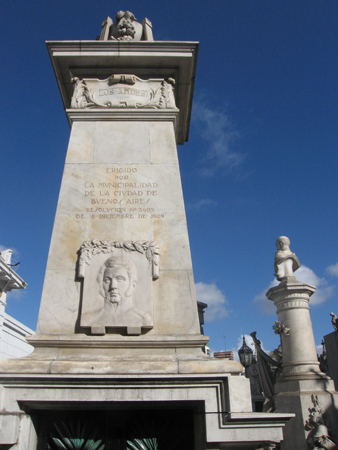 One of the main protagonists during the complicated birth of Argentina, Manuel Dorrego lived a life full of adventure, battles & exile with an unfortunate, untimely death. Born in Buenos Aires in 1787, Manuel’s father was an immigrant Portuguese businessman. Dorrego’s early studies were at what’s known today as the Colegio Nacional (just off Plaza de Mayo), but when revolution began in 1810, he was studying law in Santiago de Chile. Dorrego quickly joined local forces & crossed the Andes four times bringing Chilean troops to fight the Spanish. Dorrego’s actions got him noticed. Placed in the Ejército del Norte under the command of Manuel Belgrano, he eventually rose to the rank of Coronel & fought in the decisive battles of Tucumán & Salta. Dorrego’s bravery & skill was never questioned, but he was often insubordinate to commanding officers… both Belgrano & San Martín temporarily removed him from service. As the conflict with Spain was being fought, another was brewing. Disagreements over the role of Buenos Aires in regional government brought Dorrego into conflict with Supreme Director Juan Martín de Pueyrredón. Arrested & sent to Santo Domingo, the ship’s crew went rogue during the voyage, Dorrego was released, & he made his way to Baltimore to meet with other Argentines forced into exile by Pueyrredón. A change in government in 1820 allowed Dorrego to return, & his military rank was restored in order to fight again. Pushing for war against Brazil, the Federalist ideas of Dorrego allied him with Simón Bolívar. He was briefly appointed as Governor for Buenos Aires which brought him into another conflict of ideas with Martín Rodríguez & Bernardino Rivadavia. Dorrego often voiced his opinion in favor of male suffrage & economic assistance to the poor. When the war with Brazil forced Rivadavia to resign, Dorrego became Governor of BA for the second time. He tried to annul an initial peace agreement signed under Rivadavia, continued to fight, but eventually—in part due to British economic & military pressure—was forced to accept peace. The price? Removal of all territory on the opposite bank of the Río de la Plata & the formation of Uruguay in 1828. The loss of so much territory as well as conflicting political beliefs generated a conspiracy to remove Dorrego from power. 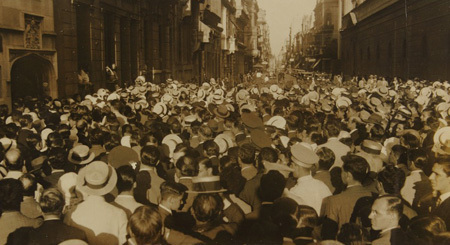 Martín Rodríguez, Salvador del Carril, Juan Cruz Varela & many others convinced General Juan Lavalle to launch an attack against Buenos Aires. Forced to flee, Dorrego turned to Juan Manuel de Rosas who advised Dorrego to go north. Instead, Dorrego’s troops fought Lavalle & lost. 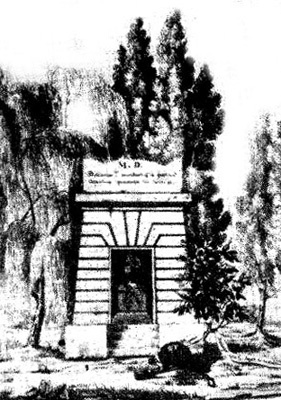 Lavalle—who had fought with Dorrego in the early days of independence—ordered Dorrego’s execution by firing squad. En este momento me intiman morir dentro de una hora. Ignoro la causa de mi muerte; pero de todos modos perdono a mis perseguidores. Cese usted por mi parte todo preparativo, y que mi muerte no sea causa de derramamiento de sangre. In this moment I’ve been informed that I will die within the hour. I am unsure of the reason for my death; but in any case I forgive my prosecutors. Abandon any reciprocation, so that my death is not the cause of bloodshed. 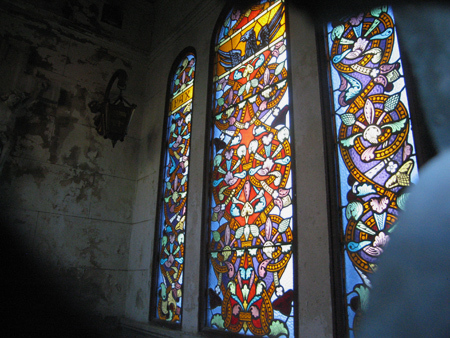 This mausoleum became a National Historic Monument in 1946. 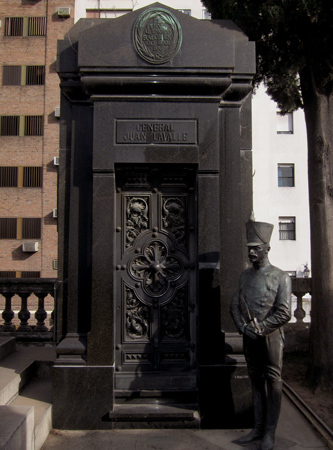 Tucked into the crowded, central section of the cemetery, the tomb of Rear Admiral Manuel José García-Mansilla is difficult to find… in spite of the impressive statue & many plaques. Born in Buenos Aires in 1859, Manuel José seemed destined for greatness from birth. 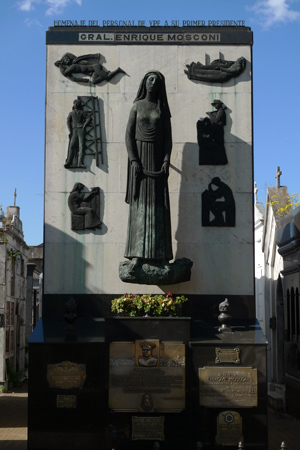 His mother, Eduarda, was one of the first women writers in Argentina & sister of Lucio Victorio Mansilla. His father was an original member of the Foreign Service who took Manuel José to the United States at a very young age, later finishing his education in France. 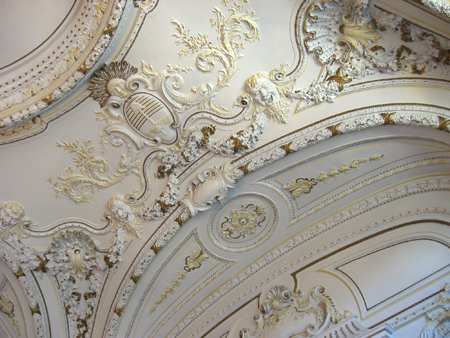 García-Mansilla showed an early aptitude for all things naval, likely influenced by his father’s work in purchasing vessels for the Argentine Navy. He decided to remain in France for military training—common in those days since Argentina had yet to found its own naval academy. While in the Red Sea, García-Mansilla heard a “man overboard! !” cry & immediately dived into the water to the rescue. Decorated as a Chevalier in the Legion of Honor for his actions, he wrote a letter to his mother regretting the fact that her gift—a watch—had been ruined in the rescue attempt. But in return, he saved a life & earned the respect of the French. As he ascended in the military, García-Mansilla helped modernize the Argentine fleet. He became an expert in torpedoes & coastal defense, even making adjustments to British designs. He also drew on his vast experience to standardize the Navy… implementing much needed regulations & adopting a common uniform. Later in life, García-Mansilla became one of the most pretigious directors of Argentina’s own Naval Academy. 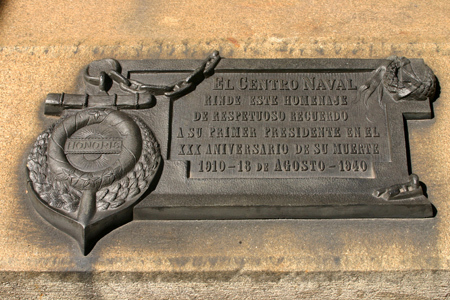 But his most visible legacy in Buenos Aires was founding the Centro Naval in 1882. 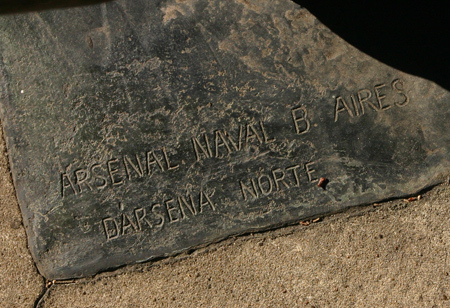 Elected as its first president, García-Mansilla believed that the camaraderie formed by social ties in the Navy were fundamental to its success as an institution. 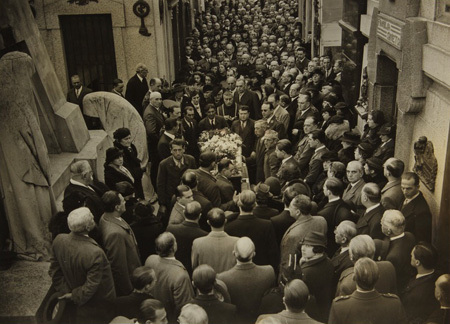 After participating in the May 1910 centennial festivities, García-Mansilla passed away on August 18th. 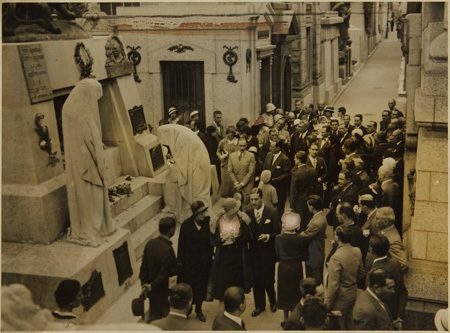 As a tribute, the Naval Academy performs a service in Recoleta Cemetery every year on the anniversary of his death… I’ll try to get photos to post here in a couple months. And since 1946, family descendants give the cadet with the most exemplary record a watch in commemoration of García-Mansilla’s dedication. Complete biography can be found here (in Spanish). 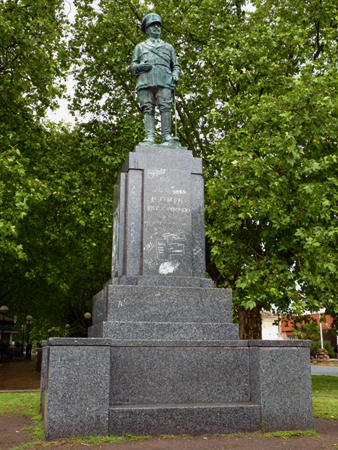 The statue is signed J. Lovatalli, Roma 1913 but no data about the sculptor could be found online. Any info would be appreciated! 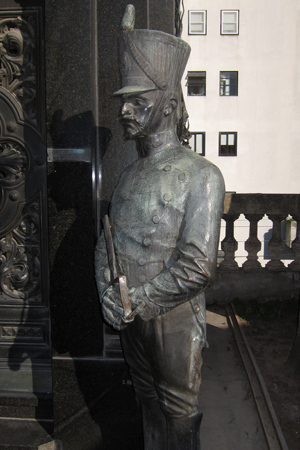 Born in Salta in 1868, José Félix Uriburu joined the Military Academy located on the outskirts of Buenos Aires at the age of 17. Five years later, he would participate in the birth of civil society in Argentina during the Revolución del 1890. But he would soon part ways with the Radicals. 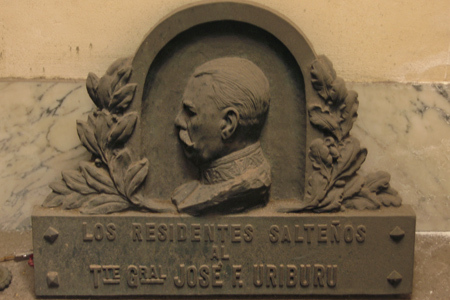 When President Luis Sáenz Peña resigned in 1895, Vice-President José Evaristo de Uriburu—his uncle—took over. The younger Uriburu became his uncle’s assistant & got first-hand experience in government. 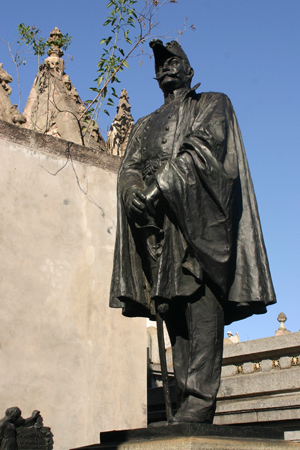 In 1905 he helped President Manuel Quintana stifle another attempted Radical coup. Uriburu continued to move up swiftly through both military & political circles. He was sent to Europe to learn techniques to improve the Argentine military & soon after elected as a representative for his native province of Salta in Congress. After obtaining the rank of Division General, Uriburu retired against his will… but would soon return to be the center of attention. 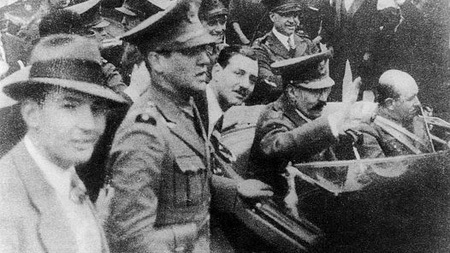 Uriburu led the first military coup in Argentina in 1930. Ousting democratically elected Radical President Hipólito Yrigoyen, historians credit Uriburu with starting military involvement in politics… a trend that would lead to a series of military takeovers until 1983. Conservative & very Catholic, Uriburu called for elections but annulled results when the Radicals won. 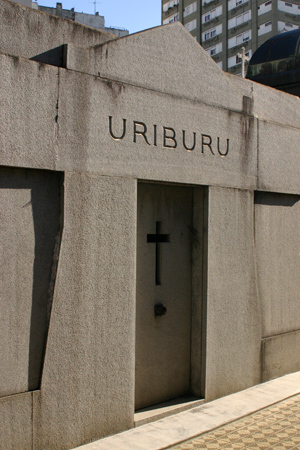 In fact, Uriburu ushered in what historians call the “Infamous Decade” where democracy was only given lip service. 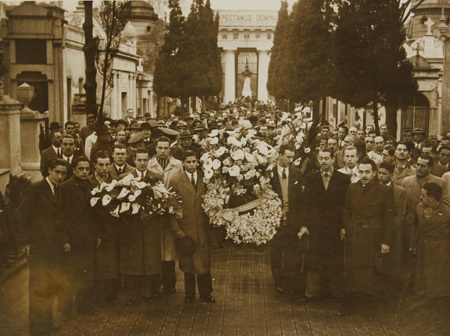 After services in Paris, Uriburu’s remains were brought by ocean liner to Buenos Aires. 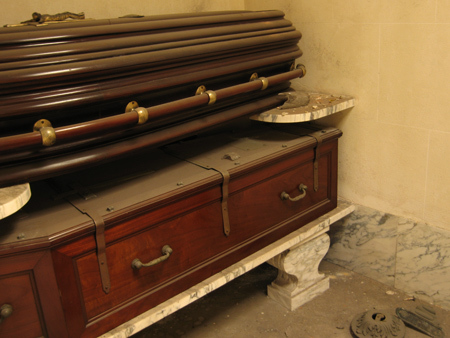 Services held at his residence led to a temporary burial at the tomb of Ramón Falcón… that fact speaks volumes. Just look at the number of people entering the cemetery. Wow. Update (14 Apr 2013): One important reminder of Uriburu’s legacy remains in the town of Balcarce, about 400 km or 250 mi south of Buenos Aires. 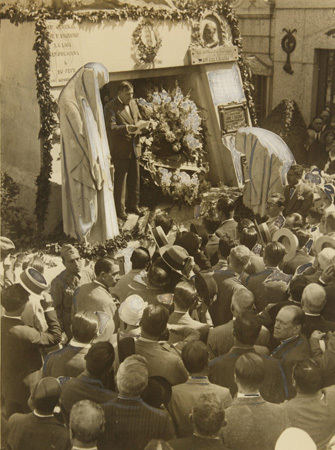 Originally meant to glorify, a bit of historical revision has occurred with the only statue of Uriburu in Argentina. 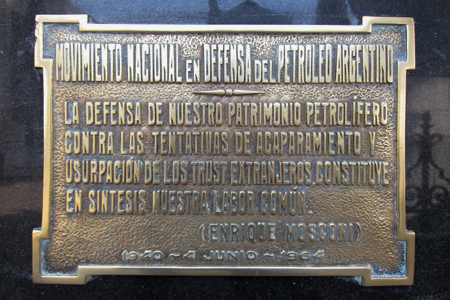 Este monumento fue emplazado en el 6º aniversario del primer golpe de estado en Argentina. El general José Félix Uriburu atentó contra la Constitución Nacional el 6 de septiembre de 1930. Este nefasto acontecimiento abrió paso a una serie de violaciones al estado de derecho y a los derechos humanos de la población, impuesto por los gobiernos de facto que interrumpieron el orden democrático, signando décadas de inestabilidad y autoritarismo en nuestro país. 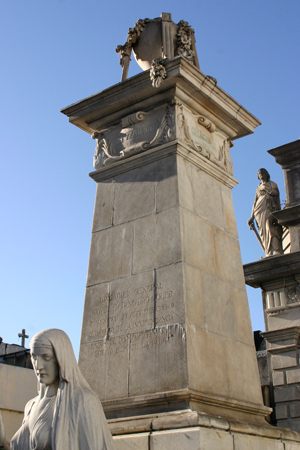 This monument was erected on the sixth anniversary of the first coup d’etat in Argentina. General José Félix Uriburu defied the national constitution on 06 Sep 1930. This horrific deed opened the way for a series of violations of the rule of law & of the population’s human rights, imposed by de facto governments that interrupted democratic order, ushering in decades of instability & authoritarianism in our country. 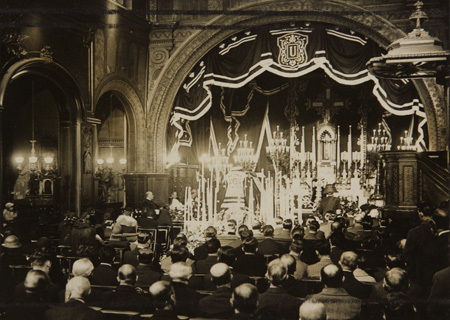 Archival photos from the British Library Endangered Archives Programme. Balcarce photo courtesy of Marcelo Metayer. 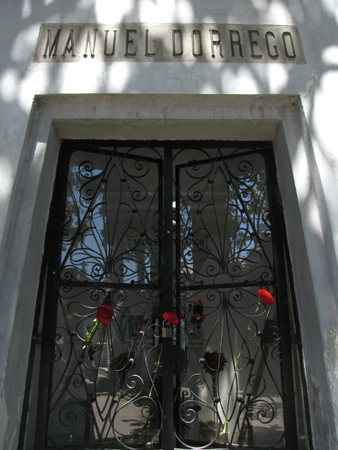 Although very much deserving a spot in Recoleta Cemetery, it’s amazing that Lavalle ever made it here. 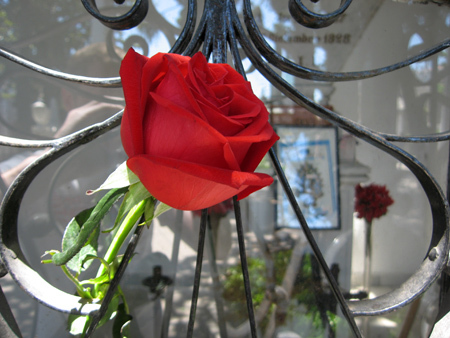 His remains traveled almost as much as those of Eva Perón. Juan Galo de Lavalle was born in 1797 in Buenos Aires, a direct descendant of Hernán Cortés. Amazing but true. 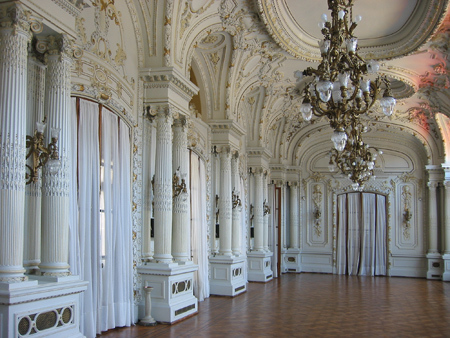 He spent a good portion of his childhood in Santiago de Chile, but the family returned to Buenos Aires in 1807. Five years later at the age of 15, he joined the Granaderos where he fought under the command of Alvear & eventually served under San Martín in the Ejército de los Andes. Lavalle participated in many of the major battles of independence, reaching the rank of coronel. Lavalle found a moment to marry a woman from Mendoza, but he was soon placed on the battlefield again during the war with Brazil (1825-28). 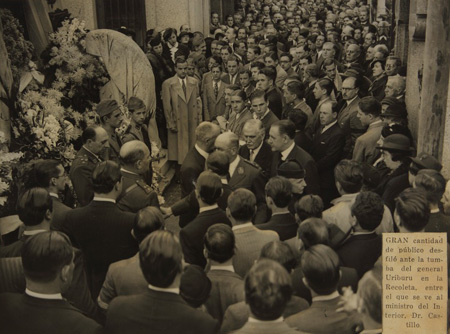 As a result of the war, Uruguay was created as a buffer state between Argentina & Brazil. The peace agreement signed by Manuel Dorrego drew feelings of resentment at the loss of the opposite bank of the Río de la Plata & internal tensions grew. Salvador del Carril & others convinced Lavalle to support an alternative government, against that of Dorrego & Juan Manuel de Rosas. 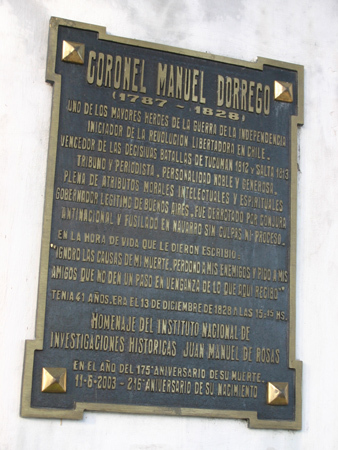 Even though they had been childhood friends, Lavalle ordered the execution of Dorrego who had been captured. It was a decision he would regret for the rest of his life. 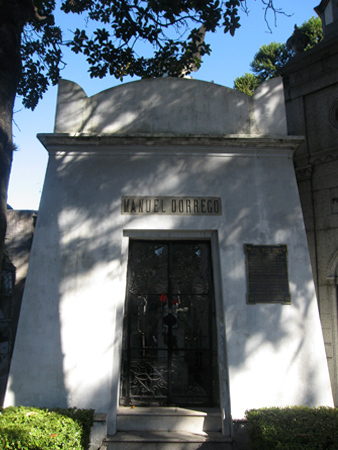 Instead of resolving an internal conflict, Dorrego’s execution sparked a civil war. Lavalle went into exile to Uruguay & commanded forces from there in an effort to defeat Rosas. But in 1840, the troops of Rosas managed to chase Lavalle all the way to northwest Argentina. 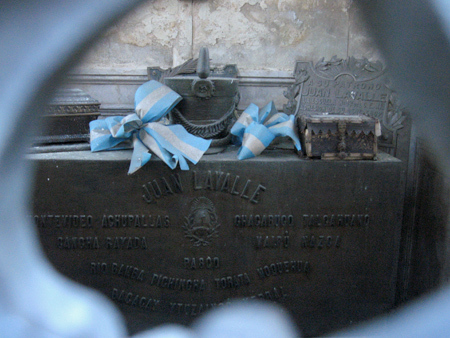 Discovering where Lavalle was spending the night in San Salvador de Jujuy, troops shot at the house & Lavalle was mortally wounded. 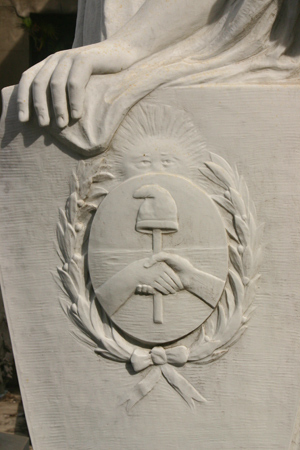 He died in 1841. Officers were ordered to decapitate Lavalle’s body & display the head publicly, but troops loyal to Lavalle took his body further north. The next bit is particularly gruesome. Decaying & difficult to manage, they removed Lavalle’s flesh from the bones, placed his heart in a jar with alcohol & his head in a jar of honey. 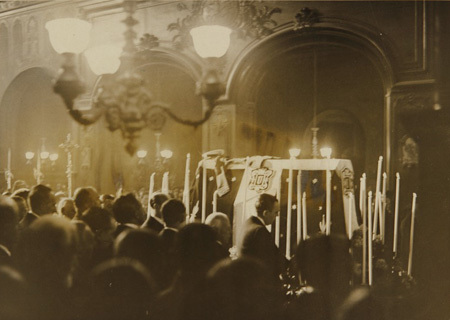 Lavalle was eventually laid to rest in Potosí, Bolivia. 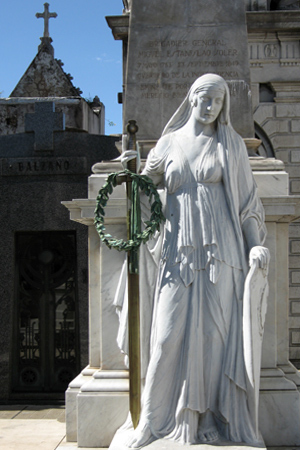 The following year Lavalle was moved to Valparaiso, Chile & only in 1861—after the destitution of Rosas—could Lavalle return to Buenos Aires & be buried in Recoleta Cemetery. 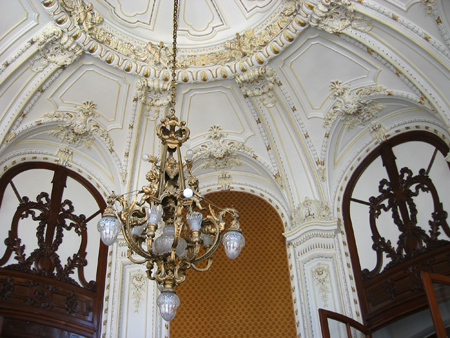 Granadero! Vela su sueño y, si despierta, dile que su patria lo admira! Soldier! Guard his sleep &, if he wakes, tell him that his country admires him! Born in Buenos Aires in 1877, Enrique Mosconi spent a couple of years during childhood in Europe but his family eventually returned to Argentina. After finishing elementary school, Mosconi enrolled in the national military academy & graduated at the age of 17. Typical of the era, the military was becoming more professional & Mosconi decided to study in civil engineering. Graduating in 1903, he was sent to learn about energy & communications in Europe & brought the best technology back to Argentina. 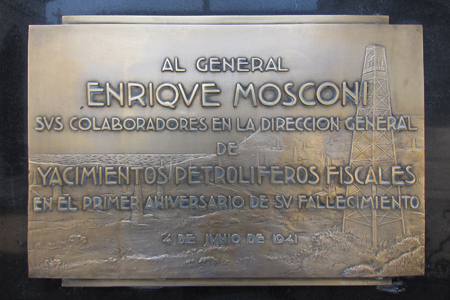 In spite of his early contributions, Mosconi would be most remembered for his next assignment beginning in 1922: General Director of Yacimientos Petrolíferos Fiscales (YPF)… Argentina’s state-run petroleum company. 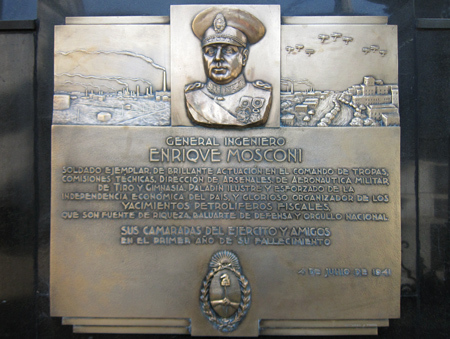 Although not an expert in the field at first, Mosconi did his best to improve working conditions in Comodoro Rivadavia where the first discoveries had been made in 1907. Becoming highly influential & respected, Mosconi had the ear of President Marcelo T. de Alvear & usually received anything he requested. As a result, YPF grew as a company & demonstrated that Argentines had the capability to manage every aspect of the petroleum industry… from perforation to refinement. A few days after the military coup which ousted President Hipólito Yrigoyen in 1930, Mosconi resigned from YPF. Several key government positions were filled with people friendly to foreign oil trusts, & some historians think the coup could have been partially supported by Mosconi’s enemies. 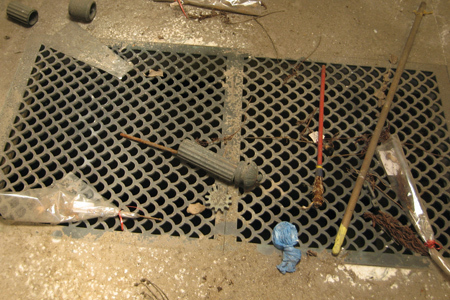 Perhaps because of this, Mosconi disappeared from the scene. Despite a stroke which left him partially paralyzed, he traveled extensively & wrote influential books about the petroleum industry, winning many awards abroad for his ideas. Mosconi passed away in 1940 while living with his older sisters & had only a few pesos to his name. 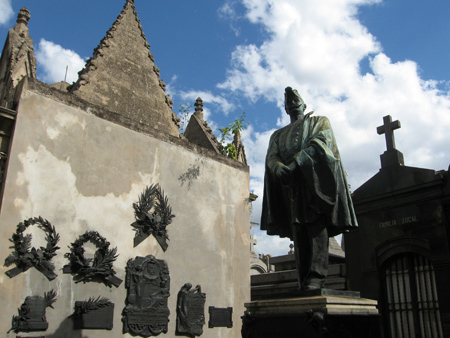 His crypt is a wonderful monument to mid-20th century art, built with YPF funds. Although Mosconi may not have increased production to the extent he projected, he took a marginally run company & made it a source of national pride. No doubt Mosconi would have been horrified if he could have seen into the future when YPF was purchased for U$S 15 billion in 1999 by the Spanish company Repsol.